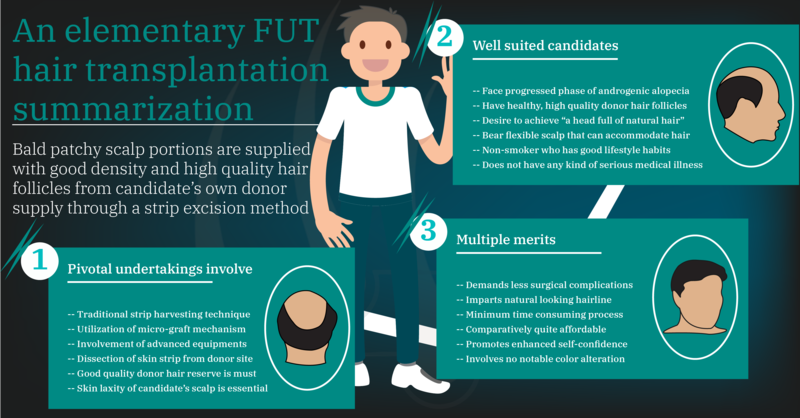 The Follicular Unit Transplant (FUT) combines the traditional strip harvesting technique with modern micro-grafting making this the most commonly performed procedure. It is done by cutting off a strip of suitable skin from the correct position on the scalp that is chosen as the best donor site. This piece of skin will contain numerous 1,2,3,4,5 hair follicular units which will be dissected off the skin and further then be cut out and grafted on to the recipient area of the scalp where hair needs replenishing. After the skin has been cut out, the wound will be closed and sutured together leaving a temporary linear scar that will take several months to completely fade off. Hair doesnâ€™t only grow in one strand alone; it does in groups of 1,2,3,4 hairs under a group referred as a follicular unit. These follicular units will not be noticeable to usual sight and even close inspection of naked eye. It is once when the scalp is close cropped and the scalp is viewed through a stereo microscope that the follicular units are clearly identified. And a hair transplant surgery works with these follicular units to form the best results that look end up as the most undetectably natural. After maintaining proper pre-operative instructions when the patient arrives for the surgery, optional scalp exercises can be performed by the patient to loosen up the skin of the donor zone and then oral sedatives are given if the patient has opted for and then the FUT hair transplant is begun with an injection of local tumescent anaesthesia to numb and stiffen the scalp. Then the surgeon clips short the hair the donor zone that is usually above the slighter curve at the back of the scalp called occipital protuberance and once the patient is comfortably positioned and the scalp all numb, a sharp scalpel is used to cut the donor strip. The Donor Strip is excised following an accurate angle and width that depend on the patientâ€™s donor requirement and scalp laxity. If the patientâ€™s scalp is too tight then stripping out a normal size strip will be impossible, and if the scalp is too flexible and lax then there is chance of a bigger scar. Usually around 100 healthy follicular units can be harvested from each centimeter width and length of tissue, and if 20cms of skin can be excised it can provide up to 2,000 follicular unit grafts. That is enough to cover for a large grafting. Once excised, then the skin strip is further used for graft dissection where the 1-4 hair follicular units are separated under a stereo microscope and the donor area is closed and sutured. Assistant surgeons take the skin strip for microscopic dissection wherein the individual 1,2,3,4 hair follicular units are separated with a little fatty tissue creating a complete hair graft and these are hair grafts are sorted according to their numbers kept in cold storage in a saline solution that imitates the bodily fluids the follicles are accustomed living in. Meanwhile the surgeon will be busy creating the recipient site for placing the follicles. The recipient site is created by the surgeon making pinprick slits to the bald area. And the surgeon creates the slits in an individualistic pattern using the graft numbers, like 1-2 hair grafts are used in the front and the more numbered grafts are used into the central part where the bald patch is greater. The pattern of the hair transplantation is done with the intention that it looks dense and at the same time resembles the natural occurrence of hair.